Achieving success in any long distance move requires proper planning. However, planning is not an easy task. You need to organize every aspect of your moving and packing properly. You also need to complete every task on your moving shortlist. If you hire a professional mover, you will be provided with a long distance moving estimate. This will enable you to make adequate provision for every moving expense. It’s no secret that there are dishonest and deceitful movers out there. These movers use bait and switch tactics. They lure you with a lower quote just to beat the competition, whereas they have hidden moving charges. After securing the moving contract, these dishonest movers continue adding extra fees and charges. These hidden costs can include packing labor, supplies, moving insurance, long carry fees, and so forth. In order to avoid these fraudulent extortion, it is advisable to deal with reputable and trustworthy moving companies. The moving company should be fully insured and properly licensed. The company should have a reputation and proven track record for providing excellent and detailed services. You can be certain that such a company will give you an accurate long distance moving estimate. Furthermore, online estimates or estimates given over the phone are only an approximate idea of the overall moving cost. They can never be accurate. For an accurate long distance moving estimate, the moving expert will have to look at the items and belongings you want to move. 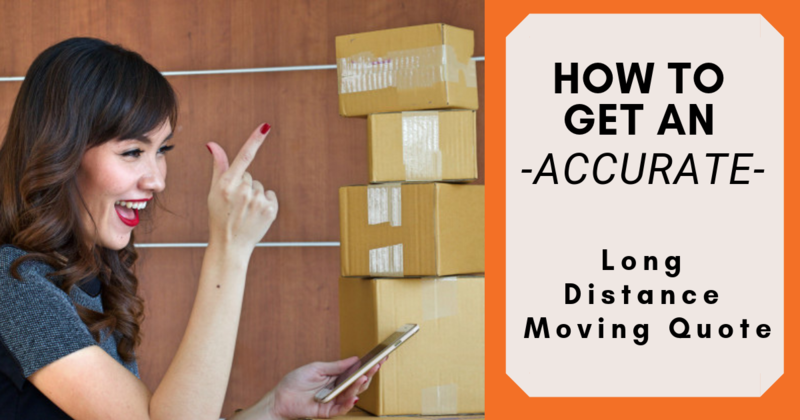 This will help determine the weight of your shipment, the time it will take to pack, the amount of labor/movers needed, and other additional costs for long distance move. With this, the company representative will be able to arrive at a realistic and accurate moving estimate. Also, getting an accurate estimate requires that you provide the moving company with all the necessary information about the belongings you are moving. Show the mover every item in your home you need to move. This should include large appliances, furniture, as well as the smaller items and other personal belongings. You can make an inventory of the items and belongings before the mover arrives. Try as much as possible to avoid any form of confusion or misinterpretations. By providing all the necessary information, you will get an accurate estimate for your move. However, the overall moving cost will be affected by the date of your move. Moving on a weekend, public holiday, or during the peak moving season usually cost more. You will be charged extra for moving during such a busy moving period. If you are looking to save cost on your long distance move, avoid the aforementioned dates and be flexible with the chosen date. The distance between your front door and the parking lot. Other constraints which make it tough for moving trucks to reach your home or destination. All the conditions and hindrances mentioned above will call for extra effort, labor, and time when moving your items and belongings. This will help the moving company determine the number of workers, time, and the size of the truck needed for your long distance move. With this, you will be provided with an accurate moving estimate. There you have it! Above are some tips that will help you get an accurate long distance moving estimate. Once you receive the moving estimate, go through it thoroughly. Ask questions about the reason for the charges. You can also ask about their moving schedule change policy. Once you have an accurate estimate, you can plan and budget adequately for your relocation. Are you moving from one state to another? Contact us today at Move It Cube It for an accurate long distance moving estimate. Our services are affordable, prompt, and well-detailed. We will move your items and belongings using our weather and water resistant modular cubes. This will help keep your belongings safe during the move. They will be delivered securely at your destination. We guarantee you a hassle-free and enjoyable long distance moving experience.